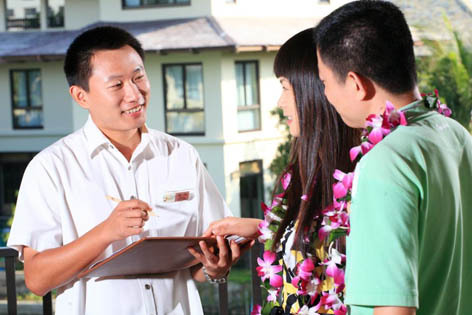 To enhance the service quality of the hotel industry in Sanya, recently, the Sanya Tourism Association and International Golden Key Organization have jointly launched special hotel service training courses, reports qq.com. During the training course, Mr. Denisbio, the majordomo of Golden Key Organization gave a speech entitled “The International Trend of Personalized Service in Luxury Hotels”. More than 100 management staff from Sanya hotels attended the training course. The “Golden Key”, initiated by a French non-governmental organization in 1929, has developed into a top international standard for hotel service. Candidates have to go through very tough tests to acquire the “Golden Key” medal. According to the Sanya Tourism Association, they will invite some famous professors to give regular training courses in terms of foreign language service and tourism service manners each month in the future.